When my children were young, I dreaded play dates at our house. Well, I didn’t dread the play dates. I dreaded that the play dates came with mothers attached, and I always felt the need for my house to be clean when they came. 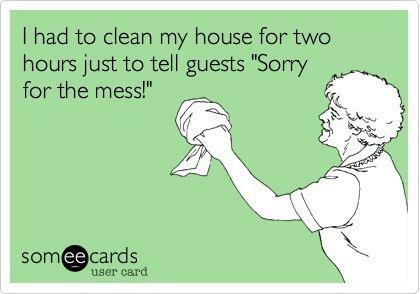 Since, I’m not a naturally clean person, the hours before the play date were generally filled by manic cleaning. These days, when my children”get together” with friends, I generally only see other parents when I wave from the front door. That means, I stress less about the condition of my house. That’s why I was amused the other day when my son was excited that we had purchased a new vacuum cleaner. He wanted to clean his “teen cave” in the basement before a friend came over. I am under no illusion that he inherited some mutant “clean” gene, and I know his concern was probably related to the fact that the cat’s litter box is in the basement. But his interest in cleaning made me smile anyway. Posted on March 16, 2014, in Family, My life, perspective and tagged 365 reasons to smile, children, cleaning, memories, musings, parenting, People, smiles, Thoughts. Bookmark the permalink. 22 Comments.